« Supercuts Offers a Time-Tested Opportunity for Moms and Ranked #1 in the Hair Care Industry! In my house, the holidays are all about bringing together family and friends and celebrating the year and each other with wonderful food and treats. I have to admit that one of my guilty pleasures has to be chocolate, and I try and find a way to incorporate chocolate into every holiday dessert I serve. That's why I am extremely happy to have found a delectable new source for high-quality chocolate and unique desserts called Hotel Chocolat. I have always wanted to try a fondue-style dessert, but just never got around to preparing what was needed. Thankfully, Hotel Chocolat made it super simple for me by allowing me to sample their Large Dipping Adventure...and what an adventure it was! 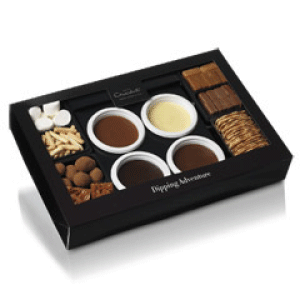 I reviewed the Large Dipping Adventure from Hotel Chocolat, which retails for $49.29. Now that's a feast for your palette! I couldn't wait to get started sampling all of the marvelous items included in the Large Dipping Adventure. Preparing everything couldn't have been easier. All that was needed was to microwave the individual pots between 2 minutes to 3 minutes, depending on your microwave's wattage. Since I wasn't completely sure how strong my microwave was, I simply started on the highest recommended wattage and increased the cooking time until the chocolate was nice and melted. Next, you stirred the pots and allowed them to sit for 2 minutes before diving in! 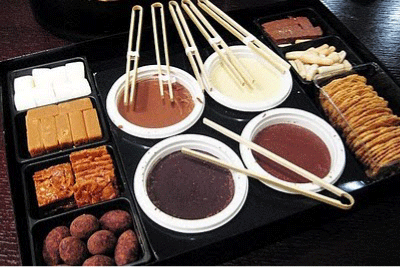 I have to admit that my favorite things to dip were all sweet, like the marshmallows, fudge and Brazil nuts. I also liked the Sesame and Sea Salt Paper Waffles, which gave the sauces a new twist and a different flavor. Once my husband and I started dipping, the adventure truly began and we got out some apple slices, orange wedges and strawberries and dipped away. I LOVE chocolate covered strawberries and found that the white chocolate strawberries were absolutely divine! I think that this would be a perfect gift for anyone who loves to entertain or who has a love affair with chocolate. Make sure to have plenty of fruit, pretzels, cookies, brownies and nuts on hand too and see where your dipping adventure takes you! Disclosure: I received the Large Dipping Adventure from Hotel Chocolat in order to facilitate my review. No other compensation was received. This product review is based on my own personal experiences with this item and is completely honest and objective.